If you have dared yourself to indulge in the incredibly engrossing world of Diana Gabaldon’s Outlander book series, or the first two episodes of the impeccably cast Starz tv-series, then you will perfectly understand why I am so enamored with this series. Eventually, I will have a much more comprehensive discussion of the book series, but reading it while working on my own highly involved steampunk book series (a book of an entirely different genre than the high-stakes, timey-wimey historical drama that Outlander happens to be). For now, I lack the writing energy or stamina to expound further on all the nuances of character and historical machinations of plot that really make Diana Gabaldon’s series shine, and feel starkly real in the mind of the reader. 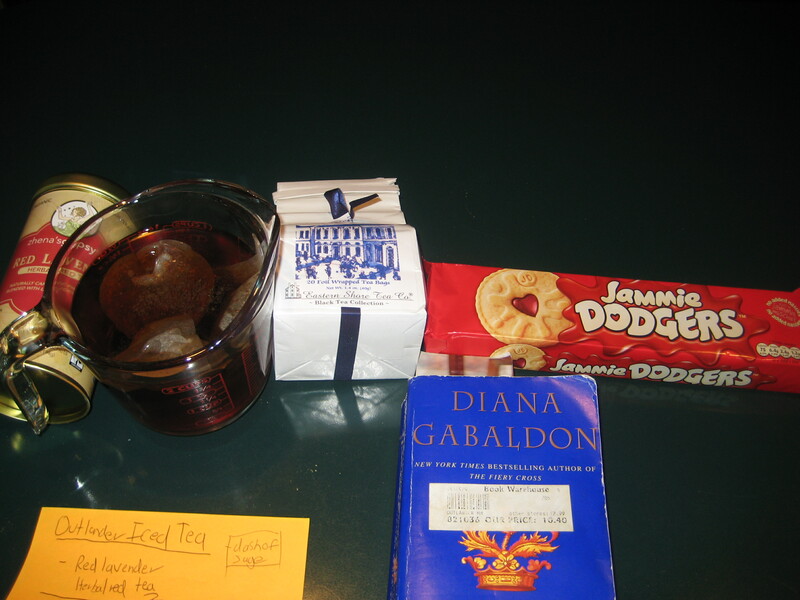 I almost feel like I’ve been living dual lives, between eighteenth century Scotland and twenty-first century America. There is a rich underlying psychological narrative, in the series, that deals the way a modern historian, tries to understand the deep contrasts of social mores and laws of different periods of time in human history. For those that have not read and enjoy versatile historical fiction novels that are comprised of so many different elements that make up great fiction, you should really try reading Outlander, or catching up with the Starz television series, for those that have a subscription to Starz. Outlander fans, I invite you to join my discussions here on my blog, of each episode of the show (as compared to the book) every single Monday, following the airing of the show. I’ll try combining a discussion of the first three episodes of the show in one singular post, beginning next Monday. 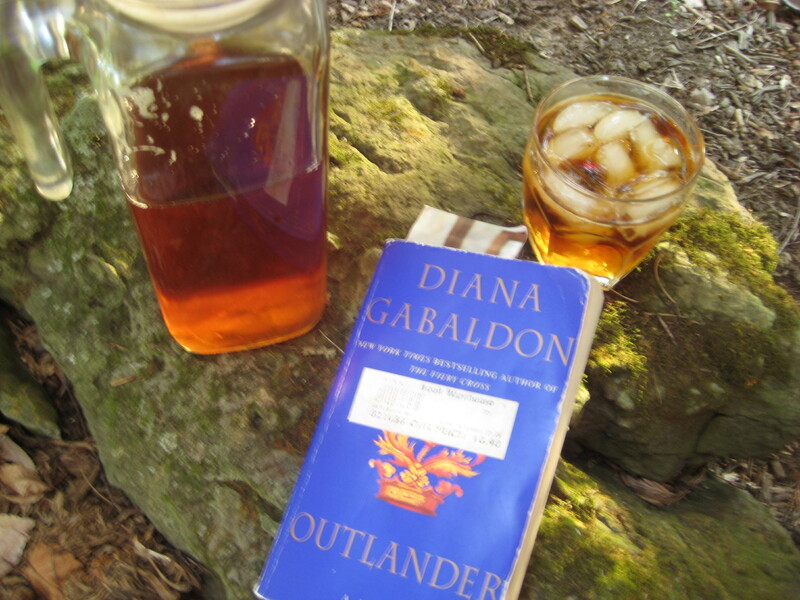 While you are awaiting Outlander Mondays, here is a special bibliophile iced tea recipe. This tea is aptly titled Outlander tea, and it combines (1) 2 Eastern Shore Canton Spice tea bags (composed of spicy ginger, black&green tea); this is the Jamie part of the tea, very robust, and it has that strong taste that is both memorable and lingers in your mind. I picked this tea, because it really serves as a metaphor for Claire’s lasting impression of Jamie (and his rich mysterious history, that unfolds throughout the course of the novel & show . (2) 1 Gypsy Zhena Red Lavender Tea Bag, I intentionally chose this combo, because it reflects the dimension of Claire’s character, which is revealed through her growing relationship with both Jaime and the world of eighteenth century Scotland. It has a strong, tangy taste (uniquely feminine in many ways, with the lavender). The lavender, in this tea, is french lavender, representing the fact that Claire is sometimes seen by Jamie’s compatriots as being French, due to her last name. Yet, lavender is very strong, resilient, and Claire is a very strong spirit, who really helps exhume a burrowed part of Jamie’s personality. Of course, you need to add a dash of extra-ginger, to make the taste stronger, as you are reading, and the emotional connection between both characters deepens. In much the same way, each brew of tea really represents their personalities. The extra spices further augment the richness of the blend. So, you’ll want to add a dash of sage (representing Claire’s medical expertise), and some ginger (representing Jamie’s military prowess and strong courage. Both characters are uniquely strong, and their relationship resonates with readers, just as the taste of this tea will hopefully do. Now, you’ll have your own potent Outlander iced tea to accompany your binge-reading sessions of Outlander!! I didn’t notice this comment till now, and I agree the books and the show are both excellent. Outlander is up there now with Interview with the Vampire, as being one of my favorite novels of all time.